…but this blog post puts it into context: it wasn’t just the times, but also the 50s mindset of the staff. 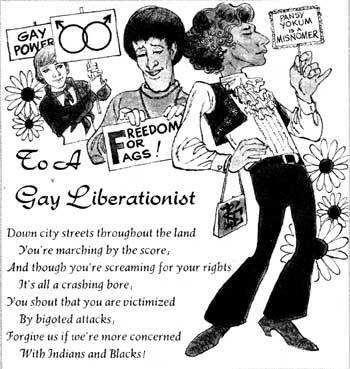 The liberal free spirit I’d like to teach the world to sing in perfect harmony mindset of the 60s-70s didn’t usually extend to Teh Gay. Check out the limp wrist in that Jack Davis cartoon. This is the world I came out into. 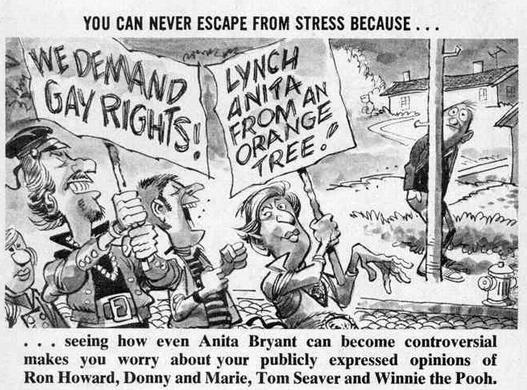 That summer of 1977 I had to listen to the BBC on my shortwave radio to hear the news from Florida because none of the TV and domestic radio news bothered to say anything about something that was obviously not of interest to decent normal people. Close to midnight sitting by the shortwave I learned that three out of four voters in Dade county had voted to kill an ordinance that simply said gay people ought not to lose their jobs or their housing simply because a boss or a landlord found out they’re gay. The next day as I walked through the city I found myself counting down three people for four I passed…trying to grasp the scope of how much people like me were still loathed.